GP New Internet Offer 500 MB Tk 5 for 7 Days 2019! Grameenphone brings a low price internet pack for GP selected customers. GP customers Surprise in Return, if you have a GP SIM not user since 2nd February 2018, then you get 500 MB internet data only 5 Tk. Grameenphone selected customer can get 500 MB at Tk 5 offer the pack validity is 7 Days, it’s incredible offer for GP customer. Dear visitor, if you interested in GP new internet offer 500 MB @Tk 5 for 7 Days, you need to read our full article, because we write complete information about the 500MB offer. 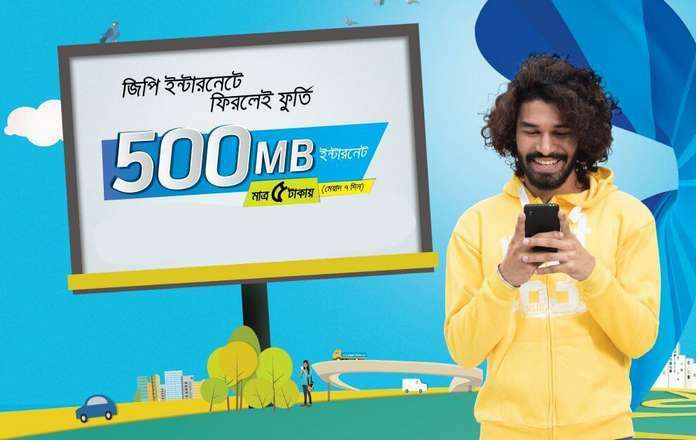 500 MB internet offer eligible for Grameenphone all prepaid & postpaid customers. The customer must be a non-data user since 2nd October 2018. To enjoy 500 MB internet at Tk5 customer need to dial code, *121*3210#. The validity of internet offers 7 Days. USSD *121*1*4# dial to check remaining internet volume. A customer can get this offer only one time. After the end, data/ validity customer will be charged to the primarying account balance. Great! You browse GP New Internet Offer 500 MB @Tk 5 for 7 Days full article, thanks a lot for the visiting our Bangladesh mobile operator news blog. Dear visitor, if you have any question about Tk5 for 500Mb comment us, we reply your comment as soon as possible.